We're setting data, code and APIs free. 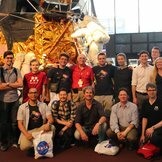 In anticipation of NASA's New Horizons approach of Pluto, Team Mendeley held a series of space-themed hack days making use of NASA datasets and APIs. George Kartvelishvili, a developer at Mendeley, stepped up to solve the space-themed hack days. Mendeley is an educational tool to help understand and appreciate the Solar System, acting as an easy, fun entry point into the world of space exploration. George chose to work on a solar system simulator with great results! This project was born from a desire to create a simplified, accessible version of the Solar System, to reduce its vast scale and complexity into something manageable and readily understandable. "Space is hard" they say. This was an attempt to make it flatter and easier, while retaining the fundamental physical characteristics and relationships of the planetary bodies and interstellar craft. The project is an in-browser, virtual representation of our Solar System. Much like an Orrery, an intricately crafted clockwork device of the days of yore, it accurately simulates the positions of the "original" nine planets. The user is able to set the simulation date and control the speed of the passage of time, thus allowing to see the relative motions of the planets at a glance. It is also possible to see the movement centred on a planet of the user's choice. A special visualisation mode show the intricate traces these planets make in space. In addition, it contains a rudimentary spacecraft ("Woket") launch system. The spacecraft accurately simulate the gravitational interactions with the planets while in flight, introducing a gaming aspect. Hacking offers a number of major benefits to any organization. It encourages creativity by allowing people the time to try out new things. Failure is an option! Providing you learn from the experience, it can be just as valuable as outright success. It also allows people to share knowledge and skills and to work with people who aren't in their regular teams. It also helps people to build confidence by presenting their projects to the group, and to get feedback on how they could further improve their projects. Mendeley develops reference management software for the research community. They organize monthly hack days in their London office, where everyone is encouraged to work on personal projects and to learn new skills.